Whether you're presenting training exercises, team meetings or a sales pitch, you can present like a pro, deal with technological glitches, appear calm under pressure, and deliver value-packed virtual presentations. Millions of web meetings take place every day, yet they are often boring, poorly conducted, and technologically challenged. But that doesn't have to happen to you! Now you can learn how to make your online meeting as engaging as an in-person presentation. 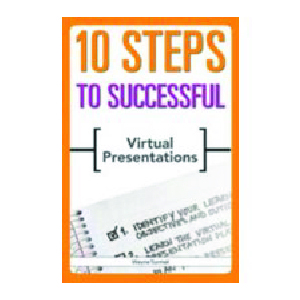 Whether you're presenting general information, training exercises, team meetings or sales pitches, this book helps you present like a pro and appear calm under pressure. You can facilitate discussions, handle Voice over Internet Protocol (VoIP) issues, listen to and engage your audience, and multitask effectively. Plus you'll have case studies, rules of thumb, ready-to-use tools, checklists, and tips to share with coworkers. With this book to guide you, you can become a competent, confident, credible online presenter and deliver real value to your audience.